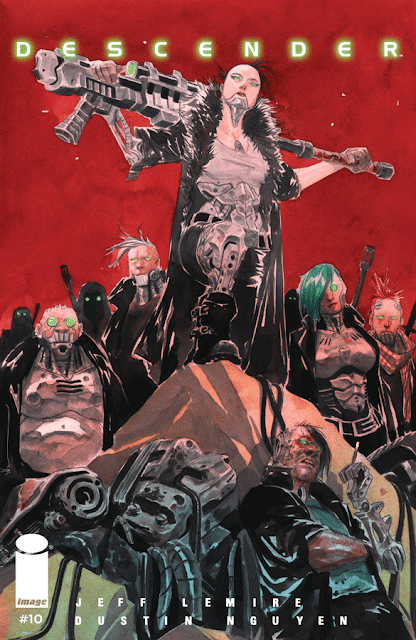 'Descender' #10 delves deeper into the expanding world Jeff Lemire has conjured up and it adds more character development along the way. TIM-21 lands on Machine Moon, a hidden refuge for robot-kind, and as welcoming as it is something doesn't feel right. Andy seeks the help of the Between, a rogue group of survivalists, that could help find TIM. There are some major narrative changes that keep this book humming along. It's an awkward arrival for TIM, Telsa, and Dr. Quon on the robotic paradise. Telsa is suspicious of their hosts but Quon is excited to sit-in on the TIM-21's examination.The TIMs have a great exchange about what makes family as 21 tries to take part in 22's more advanced video games and books. It's really a sweet scene that Lemire crafts that is endearing and sad. It humanizes TIM-21 some more and reiterates his "love" for his human family. Quon and Telsa squabble a bit illustrating their conflicting agendas. The agenda back on their home planet isn't so calm either as Telsa's father General isn't too happy with his daughter as he tries to facilitate her return. It's no secret that Dustin Nguyen's watercolor designs are nothing short of magical. From the spartan and clean environments of Machine Moon to the dingy and chaotic landscapes of Between's world, Nguyen's innovative eye for composition and contour is second to none. Again, the interaction between the TIM's goes from an immersive and dynamic 3D video game one second to a tender sparsely illustrated panel of just the two androids the next. 'Descender' keeps unfolding and expanding into a greater space saga with new characters and a deeper exploration of the ones we know. The stakes get higher as Lemire tightens the vice around our nerves with the potential of a returning threat to the colony. Time is of the essence as to what about TIM-21 holds the key to understanding the Harvester menace. Nguyen's art is making most comic book artists look like schmucks by comparison. The worst thing about 'Descender' is having to wait for the next chapter.